Trying to determine what to "expect" from coaches over the course of a season is a pretty nebulous idea. 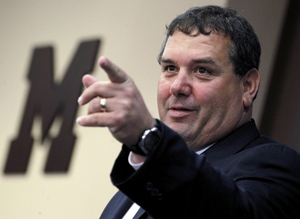 We expect Brady Hoke to point at things. We also expect him to talk about the power running game, be jovial, and recruit like a madman. 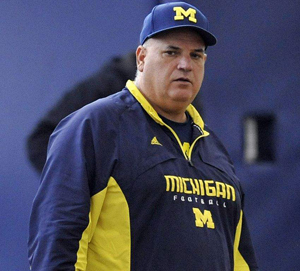 But I'm more interested in how Hoke's philosophy will color the performance on the field. A Carr descendant--one of the few from that coaching tree--Hoke is not likely to have the cavalier attitude that Rich Rodriguez had with regards to play calling. He's established that his primary goal is winning the battle on the line of scrimmage and mashing people's heads in. It's unclear whether or not Michigan's personnel can actually accomplish that. I'm skeptical, but I also trust that Hoke and his staff of coordinators are smart enough to know when something won't work. …not significantly different from the populace at large. This obliterates my argument that Hoke passed to set up the run. 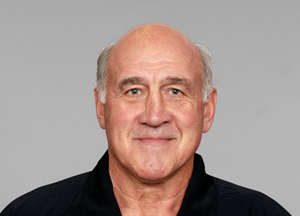 He's not neolithic but neither is he Secret Mike Leach. ...which is comforting given that Hoke's press conference make it seem as though the team will throw the ball once every five possessions. Come gameday, though, I don't expect Hoke to assume too many responsibilities. Head coaches notoriously delegate to their coordinators on gameday and generally only decide when to punt (which the team will do from frustrating field positions this season) and whether or not they want the ball the begin the game or to begin the second half. Fortunately, Hoke has hired smart coordinators to take care of all of that. My main expectations for Hoke this season are staying vigilant on the recruiting trail and handling pressure well. This team is going to have its struggles, and Hoke needs to be able to shield the team from those troubles. In addition, keeping the current commits on board throughout the season (especially if it starts to go south) will be crucial. If he can do that and continue to coach up players as he's been rumored to, he'll have a successful year. Given that he won't have the media pressure/hatred that Rodriguez experienced, I fully expect Hoke to have a fruitful first year, even if the on-field product isn't up to par just yet. I do expect, however, that at least one or two of Michigan's current commits will jump ship if the team struggles this season (7-5 kind of struggles). Al Borges gets dealt the hand of the decade, walking into an offense with 10 returning starters and arguably the most explosive player in the country in Denard. And fortunately, Borges is not a dumb man. Though he came to Michigan insisting that, "A great coach makes the kids do what he wants them to do," it's become clear that Borges is willing to mold his gameplan around Denard's singular talents. The other side of that coin is not quite as cheery: he might have to. I've made my thoughts known on Denard's ability to succeed in a pass-heavy offense, but his awful interception rate (3.8%) and poor spring game performance bear repeating. Denard has consistently had trouble throwing the ball accurately and reading defenses, which are both key attributes to Borges' West Coast/Gulf Coast style of football. The coaches and most fans agree on one thing: Denard should run the ball less. Last year, Denard was too often on the sidelines recovering from a big hit. Keeping him on the field for entire games will be essential to Michigan's success as the backup QBs on the roster are either true freshmen or woefully undeveloped passers. With a higher yards per carry but significantly less rushing yards, I imagine Denard running the ball somewhere in the vicinity of 10 to 12 times a game, nearly half of what he ran last year. In his stead, we'll see a lot more halfback rushes. As for passing numbers, Denard's diminished stats will be more of a function of his performance than Borges' playcalling. I expect the team to throw the ball about 50%-55% of the time this season. Traditionally, Borges-led offenses pass the ball less than that, but his last two seasons at San Diego State bucked that trend. I'm not sure that the offense can sustain drives with this emphasis on Denard's arm (without the constant threat of his legs as we saw last year), but I'm willing to bet that Borges will find the proper balance with the offensive personnel he has. Mattison steps into the most difficult role of anyone on the coaching staff: turning around the most foul defense in Michigan history. He's also one of the few people that will be able to quickly fix it. Aside from being one of the best recruiters in the country (Urban Meyer recently credited Mattison with roping in Tim Tebow, which, yes please), he has the pedigree. Basically everywhere that Mattison has gone has experienced significant defensive improvement, followed by a drop off after he leaves. Not to mention, he came to Michigan after coordinating one of the most devastating NFL defenses of the last decade. What I expect from Mattison is an innovative, aggressive defense whose end-of-year production will spike to somewhere in the 60th-ranked region. The team will blitz a lot and take a lot of chances, but they'll be properly coached and know how to react when things do break down. Mattison will be the godsend most assumed/hoped he would be for this defense. Meanwhile, I expect him to pull in at least one or two big-name recruits throughout the season. Though if he doesn't, it's probably because he's wrapped up fixing a seemingly irreparable defense.